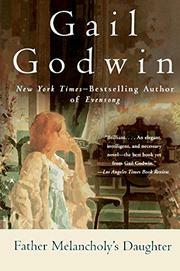 Godwin continues her probes into the chimeric stuff of family bonds--bonds within which old passions and deceits and people and affections can tower into myth. Here, the daughter of an Episcopalian priest survives (with her father) a stunning loss, then labors through childhood and youth under the burden of a deep, demanding love for an adored parent--until at last she discovers an identity outside that love. Ruth Gower, the charming, pretty young wife of the Reverend Walter Gower, priest of St. Cuthbert's, and mother of six-year-old Margaret, simply leaves one day to travel with old friend Madelyn, an abrasive, idiosyncratic artist. The Ruth who had once written Walter that "I don't want to be trivial," however, will have a fatal accident a year later in England. (Would she really have come home?) Meanwhile, that last breakfast with Ruth will be remembered by Margaret as "that glowing little moment of paradise when I walk towards her light." But there had been darkness, too, in the child's world--surely there was a witch in the closet! But most especially she and Ruth had lived with Waiter's special darkness, his "Black Curtain of recurring depressions." Even at age six Margaret planned somehow to lead him to the light: "It would be my responsibility." And so it was for the next 16 years. Throughout years of adoring, respecting and being there for a truly good, witty man and fine priest, Margaret matures, share's Waiter's scholarly interests, weathers the endearing-to-exasperating incursions of church pillars, rejects one love, yearns for another's, while all this time the beloved father--together with whom Ruth was "kept alive"--becomes a burden of obligation. At the last, after Waiter's symbolically martyred death, Margaret, in grief, drives her demons from the closet--and, with a spiritual knowledge of her own, rediscovers Ruth and a new self beyond that of clergyman's dutiful daughter. With warmly accessible characters of Trollopian clarity, much attractive erudite dialogue, a shrewd appreciation of the pull of both earthly and divine grace in word and posture, and with a bright center of spiritual substance: a handsomely rewarding novel.